In another show of conservative hypocrisy, William Alden of The Huffington Post noted that Texas had used billions of dollars in federal money to fill budget gaps in order to maintain the states emergency fund, all the while attacking the very notion of government bailouts. This is the same hypocrisy we have seen since the Democrats won the presidency in 2008. Republicans had no qualms attending ribbon cutting ceremonies for the policies they spent months attacking - and continue attacking. It appears their actions serve one purpose, and that is to regain power. Desperate to win the house, the senate, and the white house, Republicans are willing to say or do anything, and if that means collecting federal money in order to maintain the apperance in the public eye that they know whats best, then they will do it. 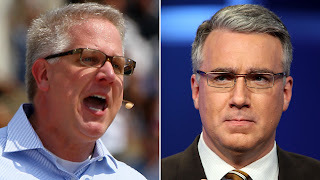 Glenn Beck has no problem talking about things he has no knowledge about, and the departure of Keith Olbermann from MSNBC is one of those things - Beck decided to speak, as though it were fact, that Olbermann was kicked off the rival cable station because he was uneasy to work with. Beck also insisted Olbermann's ratings were in the toilet. What Glenn Beck fails to mention is that his audience's size was comparable to Olbermann's, and when looking at the numbers, his ratings have been in a steady decline for some time, bleeding hundres of thousands of viewers in just a couple months, while Olbermann's ratings had remained rather consistent. I initially dismissed this story but then I read an interesting statement by David Dreier - he insisted no body was trying to get in the way of funding veterans, education, and child nutrition programs. Further investigation revealed that Dreir was mistaken and seemed to be suffering from right-wing amnesia as well - Dreier had a long voting history targeting government education programs and agencies, being named by Think Progress who along with 110 other incumbents and candidates, throught their voting record and statements, showed a desire to shut down the Department of Education. Also, Dreier was one of the 170 Republicans in the House that attempted to block Democratic child nutrition legislation by using a procedural vote. That attempt failed. What exactly did Dreier mean again when he said "There is no one in this body who wants to gut funding for important programs for our veterans or education, child nutrition? 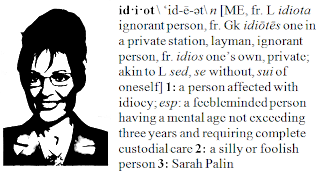 Sarah Palin thought it was necessary to join the ranks of Paul Ryan and Michele Bachmann and offer her own take on the Barack Obama's State of the Union address, but as usual with the quitter of Alaska, her Facebook post was full of propaganda, hypocrisy, and inaccuracies. 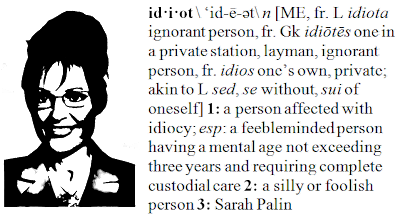 Palin ignored facts, claiming the president has raised taxes on America, despite the contrary, and insisted investment in technology and infrastructure were nothing more then "half-baked ideas." Palin even asserted on Greta Van Susteren's program on Fox News that Obama's "Sputnik moment," or the challenge of American dominance by world powers like China (which has the fastest trains and computers), is the reason why the Soviet Union fell - she believes the space race placed the U.S.S.R. into crippling debt nearly 30 years later. Palin presumably made these comments for two reasons - one was to associate current government spending to the fall of a nation(U.S.S.R.) and the other was to absolve Reagan of his sins - a popular attribution to the fall of the Soviet Union was the arms race and the willingness of President Reagan to sign checks. As usual, Palin's note was void on details and extremely partisan. The internet has been buzzing for a few days about the SOTU response by Michele Bachmann, and some have been eager to point out the hypocrisy of the video. Bachmann was criticized for looking off camera during her delivery, but the official explanation is that Bachmann was reading off a teleprompter. This is interesting because Bachmann had insulted the president for relying on a teleprompter to make past deliveries. 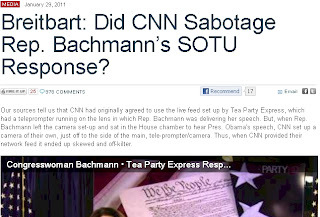 Not stopping there, the right-wing blogosphere had decided to step in on Bachmann's defense insisting we move on and forget the whole teleprompter debacle, and some took it even further - Andrew Breitbart seemed to think it was a conspiracy to discredit Bachmann.